I am ecstatic to report that Chase and I passed our Pet Partners therapy dog renewal test in June. It was by no means a slam dunk! Moving twice in the past year has not been easy for Chase. Since we moved the second time, at the beginning of May, he has been more on edge and learning the new neighborhood, which has more activity than our old neighborhood. We’ve had a few encounters with loose dogs at the park, which have made Chase wary of strange dogs. And his veterinary chiropractor reported last week that Chase’s back was the tightest she has ever seen. So we went into this test knowing it might be more of a challenge than in previous years. Although Chase and I volunteered at the local library, the Pet Partners test requires therapy animals to perform well in situations simulating hospital visits as well. The test includes handling by a stranger, walking through a crowd, taking a treat gently, recovering quickly after a loud noise, doing well with people who move erratically and people who use a wheelchair or walker, and more. The Pet Partners test location in Madison, Wisconsin was new to us. Previously we had trained and tested in Woodbury, Minnesota. On the Thursday evening prior to the Sunday afternoon test, I drove and walked Chase by the test site so I’d know how to find it and we would be familiar with the neighborhood. On the way to the test site, driving through the UW-Madison campus, Chase was a bit amped up by all the activity – people, bikes, buses, runners, dogs, etc. On test day, I could tell that I was a bit wound up, not knowing the people or the inside of the building, and knowing that Chase has aches and pains that can make him more defensive. But I knew we had to try because Chase loves people and seems to miss the library visits that we made in Minnesota. The test was well run and well managed. But once they took our paperwork and took us in to explore the room and get started, I knew we were in trouble from the start. Chase saw the people sitting there and got all wiggly and a bit vocal. I thought we might get thrown out right away because he wanted so badly to go over and meet the ‘judges’ and volunteers that I had a tough time keeping him quiet. They suggested that I take Chase all the way back outside and come back in to get started. That was a lucky break because when we went out, he immediately squatted and pooped. Since he had already pooped twice that morning and hadn’t taken the opportunity on a walk around the block on the way there, I had no idea he had to poop. I had a bag in my back pocket and found a garbage can nearby. Whew! We went back in and got started and Chase calmed down. At first I had a hard time getting and keeping his attention because he wanted to meet the new people. But I was able to get him to listen to me and complete the exercises. The testers were good about explaining what parts of the test had changed for this year. Chase did well on the parts in which they had to touch and handle him. He did well with the ‘different’ people, crowds, and loud noises. I felt like this test required much more handling from me in the past, to make sure people didn’t touch the part of Chase’s back that is the sorest and to make sure he listened to me and felt protected when needed. The part of the test with the neutral dog arrived. The dog entered the room and it was a big fluffy golden retriever, a very nice dog and well behaved, but the kind of dog that can be very bouncy and rude when encountered in other situations. I was most concerned about this part of the test for Chase (because he is sometimes protective in these situations), and he may have felt that through the leash. He started vocalizing, trying to work his way up to a bark. Somehow I was able to keep him moving the way he should and keep him from blasting out a full blown bark. But I wasn’t sure if we had passed that part of the test. I didn’t find out until it was over. To take some of the pressure off, I had already promised myself that I would give Chase a second chance later in the summer if we didn’t pass. But I was relieved and excited to hear later that we had, indeed, passed the test! This test didn’t feel as easy as before; more handling skills were required. 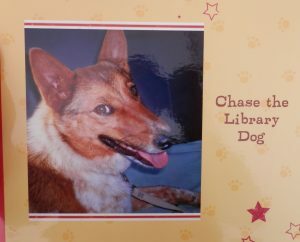 I was so proud of Chase, who passed the test at the age of about 77 (in dog years!). 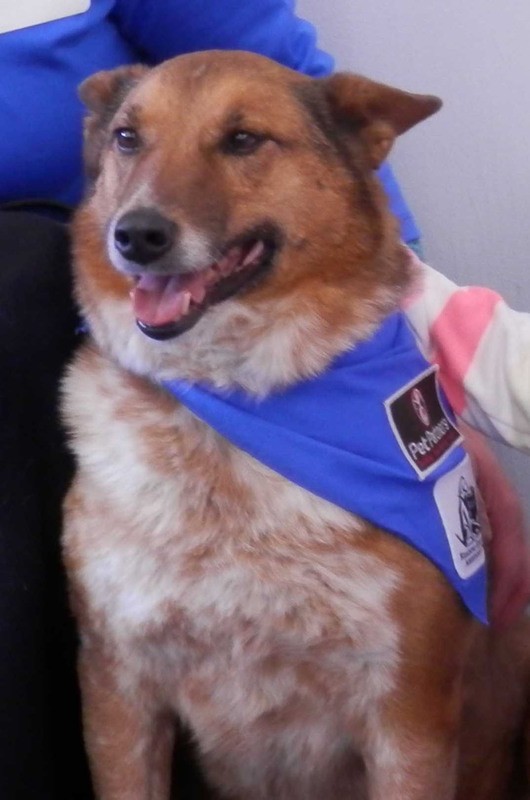 The testers liked us a lot as a team and hope we’ll join their group, Dogs on Call, Inc. (http://www.dogsoncall.org/). They told me I had excellent handling skills. I attribute that to Chase and I being together for ten years, all the training we did at All Breed Obedience & Behavioral School for Dogs in Minnesota over the years, and the great instruction from the people running the test. Not to mention Chase’s great attitude and aptitude for this work! Our paperwork has been submitted and processed, and we will soon receive our new badge in the mail. We will most likely join up with Dogs on Call and find a new place to visit here in Wisconsin! Happy Summer! Keep your dog’s skin and coat healthy with Omega Fields Canine Shine and Omega Nuggets!